Before Tennessee’s division match-up against Missouri, Vols head coach Jeremy Pruitt issued a reminder during the Vol Walk. In an unprecedented move, Pruitt gathered his team amidst the chaos on Peyton Manning Pass. He looked them square in the eyes, pointing around to the fans that engulfed them. “I just wanted them to see who they represent,” he said. “The people who come to support this university and have pride in the Tennessee football program and the university itself. It’s bigger than these guys. I wanted to make sure that they looked around. Despite its intentions, Pruitt’s speech did not inspire a Tennessee victory. Instead, Missouri (7-4) took a 26-10 halftime lead and ran with it, cruising to a 50-17 victory in Neyland Stadium Saturday evening. Tennessee (5-6) held its own early in the contest after pummeling then-No. 11 Kentucky last week. Against the Tigers, the Vols’ defense fared similarly at first by forcing field goals on Missouri’s first two offensive possessions. Tennessee took its first and only lead lead when Ty Chandler found the end zone on a 6-yard run. Chandler’s stamina boosted a Tennessee run game that finished with just 84 rushing yards, 82 of which came from Chandler on 14 carries. The Vols’ passing game fared slightly better, as backup Keller Chryst went 7-for-9 for 173 yards, including a pair of 49-yard strikes to wideout Marquez Callaway. Chryst entered in the first quarter after starter Jarrett Guarantano left with an injury that sidelined him for the rest of the game. It didn’t take long to see why Guarantano had remained the starter until that point. With the Vols down 19-10 with a chance to score, Chryst threw an interception to Demarkus Acy as the clock inched closer to halftime. The pick was returned to the the 11-yard line, and a few plays later, Drew Lock found Johnathon Johnson in the end zone from 3 yards out. Instead of holding a 19-10 lead at halftime, Missouri took a commanding 26-10 lead into the locker room. The Vols regrouped and put together another scoring drive early in the third quarter to cut Missouri’s lead to 26-17. Missouri responded with a touchdown to give itself another 16-point lead. On Tennessee’s following drive, disaster struck again. The Vols fumbled, and Joshuah Bledsoe scooped it up and ran for a 39-yard touchdown. “We moved the ball there. We just had a couple of turnovers that really hurt us,” Pruitt said. With an offensive plan coordinated by former Vols head coach Derek Dooley, Missouri found success on the ground and through the air. The Tigers rushed for 227 yards, and quarterback Drew Lock threw for 257 yards and two touchdowns in the victory. This loss marks Tennessee’s first shot at bowl eligibility, which the Vols can still achieve next week against Vanderbilt. 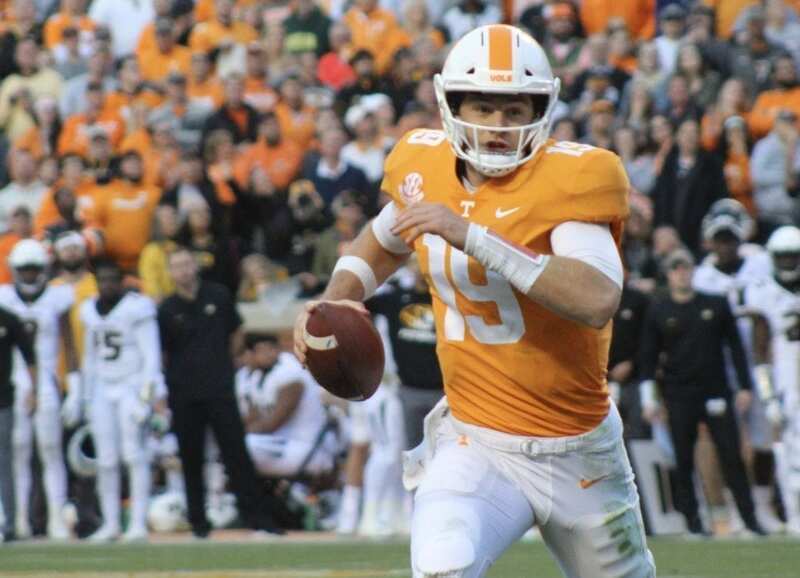 But for a senior class that muddled through the Butch Jones era, a frantic coaching search and the eventual, possible restoration of Tennessee football, the margin will sting. That ‘next game’ is slated for next Saturday in Nashville, as the Vols take on the Commodores. Kickoff is slated for 4:00 p.m. CT, and the game can be viewed on the SEC Network. Featured image courtesy of Dusty Bryan.